An ash cloud from a volcano in Iceland that has prompted the closure of airports in wide areas of Europe could keep planes grounded for a further two days. An ash cloud from a volcano in Iceland that has prompted the closure of airports in parts of Europe could force the grounding of planes for a further 48 hours, a European air traffic official said Thursday. "The extent is greater than we've ever seen before in the EU," Brian Flynn, deputy head of operations at the air traffic body Eurocontrol, told Reuters. "The meteorological situation is such that the volcanic ash is progressing very slowly eastwards but there is not a lot of wind …so it is very slow and very dense." Flynn said it could take another 48 hours for the situation to clear. The volcanic ash, which limits visibility and can damage engines, led to the cancellation of about 4,000 of the 20,000 daily flights across Europe. The ash plume drifted at between 6,000 metres and 11,000 metres. The safety risks from the cloud prompted Britain's National Air Traffic Service to ban all non-emergency flights in British airspace until 7 a.m. local time Friday. 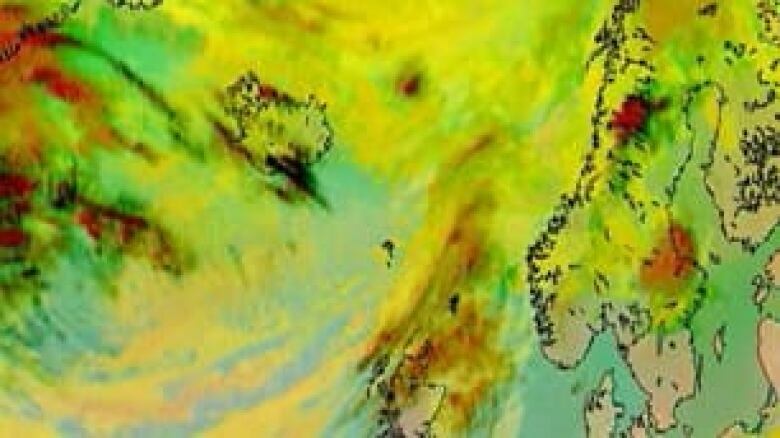 The ash cloud also forced officials to close airspace in Ireland, Denmark, Norway, Finland, Sweden and Belgium. France shut down 24 airports, including the main hub of Charles de Gaulle in Paris, and several flights out of the U.S. had to double back. The National Air Traffic Service said Britain had not halted all flights in its space in living memory, although most flights were grounded after the terror attacks of Sept. 11, 2001. Heathrow Airport in London was closed by fog for two days in 1952. In Canada, airline officials are advising passengers that cancellations and delays in Europe will force delays and cancellations in Canada. Air Canada announced that flights have been cancelled to and from Heathrow, Charles de Gaulle and the Frankfurt airport. Air Transat had cancelled all flights to Heathrow. Bob McDonald, host of CBC's Quirks & Quarks, said gritty, acidic volcanic ash can do serious damage to a plane. What is volcanic ash? Why is it a threat? Find out the answers to these questions. "If an airplane flies through a cloud like that, the ash itself will actually grind away at the machinery — it destroys the bearings and can kill the engine," he said, adding that gases in the ash cloud could cause problems with a plane's ventilation system. "It's not something you want to get into machinery and it's not something you want to get into lungs," he said. Aviation officials said they will continue monitoring the weather to determine when it is safe to start flying again. In Iceland, emergency officials moved hundreds of people away from the Eyjafjallajokull glacier Wednesday as a volcano buried under the ice rumbled to life for the second time in less than a month. The country sits on a large volcanic hot spot in the Atlantic's mid-oceanic ridge and has a history of devastating eruptions. Passengers travelling between Canada and Europe should contact their airline or check airport listings for flight cancellations. Air Canada reminded its passengers that it has revised its ticketing policy for customers booked on flights that are subject to cancellation. It said customers wishing to make alternative travel arrangements can do so without penalty, space permitting, by contacting Air Canada Reservations toll-free in Canada and the U.S. at 888-247-2262. Wednesday's eruption sent blasts of steam and ash into the air, which melted some of the glacier and sent floodwaters streaming down into the surrounding area. The main highway around the glacier has been closed and local farmers were advised to keep livestock indoors to protect them from eating ash particles that can be as sharp as glass. The ash cloud has not disrupted operations at Iceland's Keflavik Airport or caused problems in the capital, Reykjavik, but has affected the southeastern part of the island, said meteorologist Thorsteinn Jonsson. If the volcano keeps erupting, it could cause more flight disruptions. "When there is lava erupting close to very cold water, the lava chills quickly and turns essentially into small glass particles that get carried into the eruption plume," said Colin Macpherson, a geologist with the University of Durham. "The risk to flights depends on a combination of factors — namely whether the volcano keeps behaving the way it has and the weather patterns."